Often when I don't really know a great way to teach something, I end up defaulting to Making Them Do Something and Making Them Notice Something, and then finally Making Them Practice Something. I think lots of people do, and it's not bad. It's loads better then Telling Them Something, and it's certainly better than Children with Nothing To Do. But lots of times, the learning that comes out of MTDS and MTNS doesn't really stick that great. They can maybe do an exit ticket, but ask them a question that relies on The Thing in a week, and you just get a bunch of blank stares. So in my planning, I'm taking as a signpost Making Them Figure Something Out or MTFSO. I think the best existing curricula depend on MTFSO, and it must be nice to be working with one of those. So here's an example: the discriminant in Algebra 2, or said another way "What kind of roots does this quadratic equation have?" We're not particularly concerned in Virginia with them being able to define the word "discriminant," but they should be able to recognize whether the solutions are rational or irrational, real or non-real. Given a quadratic equation, they should be able to figure out what kind of solutions it has, and know how to describe those kinds of numbers. Here is a sample released item (question 50 of 50 in this document). You can find all kinds of MTDS/MTNS lessons about the discriminant. Here and here, for example. But here's what I came up with to turn it into MTFSO. 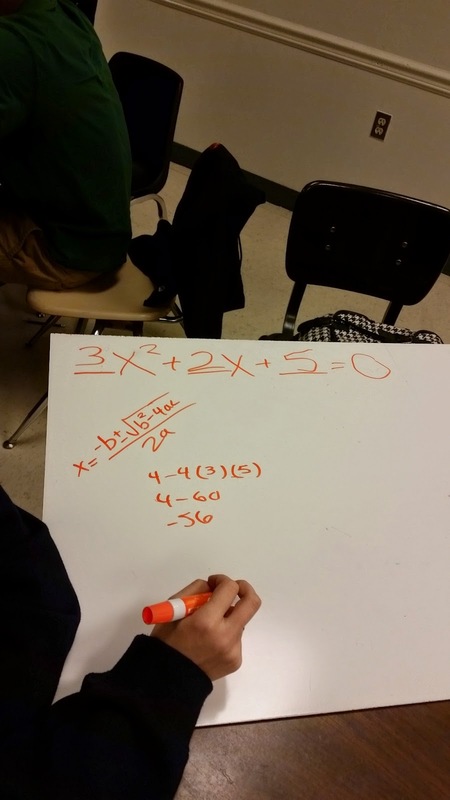 We had already spent a day on simplifying radicals (including with imaginary results), a couple days on solving by undoing and solving with the quadratic formula. Then we made a big map of different kinds of numbers with special attention to recognizing rationals vs irrational and real vs non-real. For this particular lesson, they first solved four equations using the quadratic formula: x2 - 10x + 9 =0, x2 - 6x + 9 = 0, x2 - 7x + 9 = 0, and x2 - 4x + 9 = 0. When we debriefed their solutions, we spent time describing the types of solutions, but we did not belabor the point about why the roots came out each way. A1) Come up with a new, original quadratic equation whose roots are real and irrational. 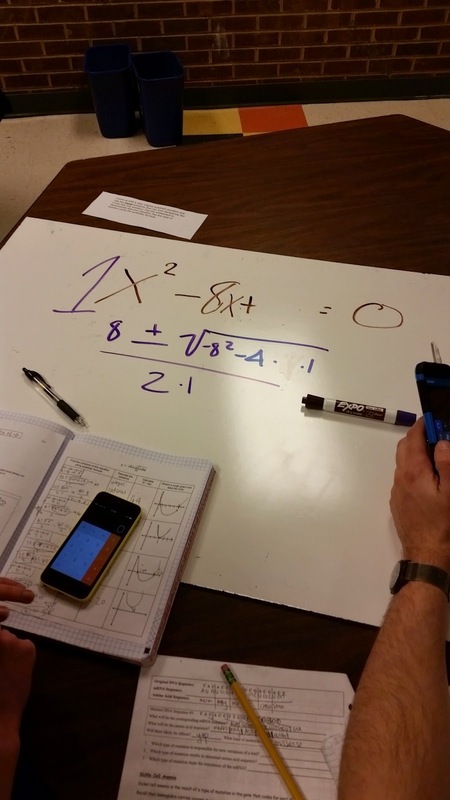 Demonstrate that your equation works by using the quadratic formula to solve it. 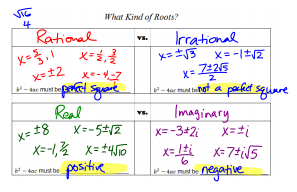 A2) Come up with a new, original quadratic equation whose roots are real, rational, and unequal. Demonstrate that your equation works by using the quadratic formula to solve it. B1) Come up with a new, original quadratic equation whose roots are imaginary. 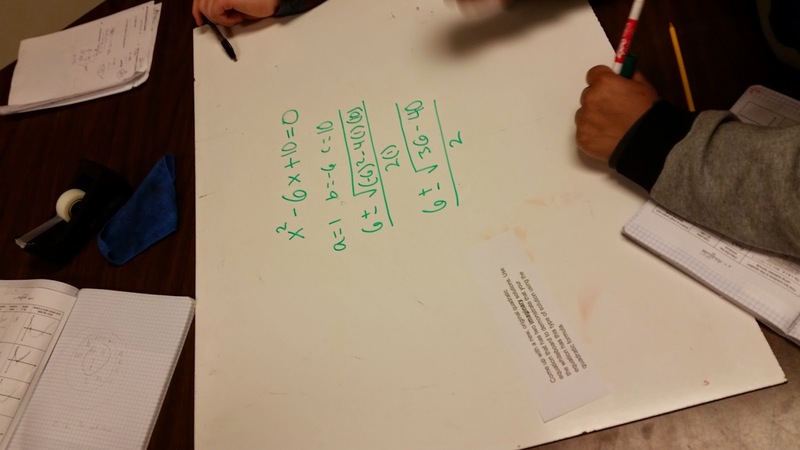 Demonstrate that your equation works by using the quadratic formula to solve it. B2) Come up with a new, original quadratic equation whose roots are real, rational, and equal. Demonstrate that your equation works by using the quadratic formula to solve it. I saw different approaches... start with a desired answer and try to work backwards. Write out the quadratic formula with blank spots and repeatedly fill in and try values. Start with an equation very close to one we had just worked with and see how it worked out. And of course the bane of all group work reared its head - one kid grabs a marker and takes over while everyone else is happy to let them. And that is that. A general understanding of what was going on persisted to the next day... We'll see how Monday goes. I finally, Finally, FINALLY have a plan I like for introducing triangle congruence theorems. For a few years there (2? 3?) I had been trying to make a go of Triangles a la Fettucine as described in this MT article. And I just couldn't work it! The principle of the thing is sound, and it always started out okay, but quickly got tedious and the kids would both lose interest and not get the point. Many students just would stubbornly not get the memo that you had to use the entire length of the colored-in sides, but you could use any length of the uncolored sides. The mechanics of the thing got in the way of seeing the larger picture. In this new lesson, I deliberately separated the triangle-creating phase from the seeing the larger picture phase. Before the lesson, I gave students the first page of the pre-assessment from this Shell Center Formative Assessment Task. (Thanks someone on Twitter who suggested that.) I did not use the lesson itself, because I felt my students weren't at the point of being able to understand what it was asking. The pre-assessment was compared to what they could do afterward, of course, but also to kind of get their juices flowing about angles and side lengths and what congruent means. They worked on the pre-assessment for about 15 minutes. Phase 1 was constructing some triangles out of construction paper based on various given information using straight edge, protractor, and occasionally a compass. Here is the instruction page. (Thanks again, Twitter, for some helpful feedback making it better before it went live to the children.) Students were in groups of 3 or 4, and the group was responsible for creating the nine triangles (There are ten on the sheet, but the last one is impossible.) For thoroughness, I'd love if every student had to create all the triangles, but I was afraid 1) that would take way way too long and 2) many students would tire of it midway through and check out. I think my instincts were right on both counts. The more difficult constructions were marked with a *, which I told the students, which allowed for some self-moderated differentiation (by less-confident students quickly claiming responsibility for non-* triangles). Before they started I ran a quick protractor clinic, and they were off. The groups worked on creating triangles for 30-40 minutes. Beforehand, I created a set of reference triangles out of cardstock, so I could quickly assess their products for accuracy when they were done. I just kept the correct ones and discarded the inaccurate ones (where an angle was not measured correctly, for example.) (Instead of making them re-do incorrect ones, but I think that would be a fine thing to do if you can swing the time.) The groups that finished first, I handed off the cardstock triangles and put them in charge of assessing other groups' work. By the time triangle construction was complete in all three of my Geometry sections, I had 10+ correctly-made copies of each triangle. I suppose you could try to recreate this experience with dynamic geometry software somehow, but I'm dubious that there's a replacement for creating physical triangles with your hands. Students directly encountered having choices for how to finish making the triangle (when they were only given the lengths of two sides, for example) vs being locked into only one possible triangle (when they were given ASA, for example). In the future, I'd like to be more deliberate in assigning each student one of each. After triangle construction, we ran through a quick lesson on notation and naming conventions for congruent polygons. Then I put up a kind of standard-looking congruent triangle proof, where enough information was given (or able to be inferred) to show that all three pairs of sides and all three pairs of angles were congruent. We wrote out a 9-step proof that proved the triangles congruent by SASASA. "Wasn't that a pain?" I said. "Yes," they said. "Wouldn't it be nice if we could know triangles were congruent to each other with a smaller set of information?" I said. "Yes," they said. In the meantime (the lesson covered by this post spanned five days, FYI) I had glued all the triangle A's to a poster, all the triangle B's to a poster, etc. Before they looked at them, I had them predict (using the original instruction sheet) whether they thought all the copies of each triangle had to be congruent. Will all the triangle A's be congruent? Will all the triangle B's be congruent? etc. Reminders that for congruence, it's okay if you have to reflect or rotate one to make it look exactly like the other. Justin Lanier and Pershan? possibly others? brought up the issue on Twitter that triangle-uniqueness (will this given information only allow you to make one triangle?) is a cognitively different thing from triangle congruence (can I be sure these two triangles are identical?). That was a slippery thing that always poked at the edges of my thoughts this time in the school year, but I'd never thought to explicitly address it. I think this lesson does a nice job of bridging those two related understandings. The triangle-constructing compels one to think whether there are choices to be made in what this triangle looks like... or is it unique? But putting all the triangles together on a poster highlights the question of do all these triangles have to be identical, using certain given information? Pretty seamlessly, I think, and without having to dwell on it. Using a recording sheet (created by my colleague, Matt), they did a gallery walk, recording whether, in fact, all the triangles were congruent, which parts were the given information, and drawing a sketch. (He provided the triangle outlines in the rightmost column -- I took those off.) Then we had a quick discussion and they made their first foray into identifying which theorem applied based on given information (the back of that sheet). And that was that! On their quiz Friday (usually we have a half-period quiz on Fridays), I asked another question very similar to one of the pre-assessment questions, and every single student showed growth in their ability to explain why the given information was not enough to guarantee unique triangles.